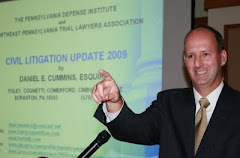 On June 19, 2009, Judge Gregory H. Chelak of the Pike County Court of Common Pleas issued an opinion granting summary judgment in favor of the defense in a case involving a plaintiff who tripped and fell allegedly due to the raised edge of a concrete pad at a gas station being a mere one inch above the surrounding asphalt. Melchiorre v. Lords Valley Xtra Mart, No. 1358-2006-Civil (June 19, 2009). Relying upon, Rocklin v. Hartmann, No. 248-2003-Civil (June 22, 2006) aff'd No. 1673 EDA 2006 (Pa.Super. Feb. 13, 2007), a prior Pike County decision in favor of the defense in a case involving a 1.5 inch elevation, Judge Chelak held that, under the "trivial defect" doctrine, the one inch discrepancy involved in the case at hand was "so trivial that, as a matter of law, Defendants were not negligent in permitting it to exist." The court based its decision, in part, on photographs of the defect supplied in the motion for summary judgment materials. In so ruling, Judge Chelak rejected the Plaintiff's argument that the trivial nature of the defect should be disregarded on account of the fact that the Defendants had notice of the defect prior to the incident. Judge Chelak held that "[p]ursuant to the trivial defect doctrine, the existence of such defects does not give rise to a negligence claim, with or without notice." The Plaintiffs filed an appeal on July 1, 2009 and the case is currently pending before the Superior Court of Pennsylvania.